Iraq: During the middle of the night, armed men attacked St. Mary’s Assyrian Catholic Church in Baghdad; they wounded two Christian guards, one seriously. Later the same day, bombs were set off at two Christian-owned businesses, both near the church; they killed one Christian shop owner, a parishioner at St. Mary’s. 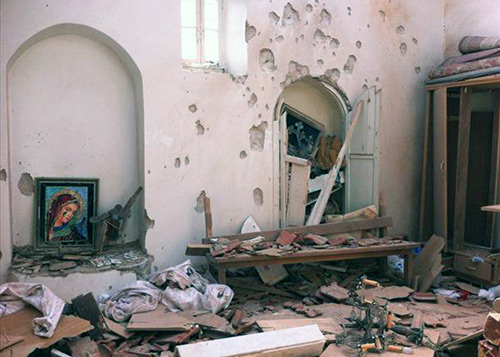 Since the U.S. “liberation” of Iraq in 2003, 73 churches have been attacked or bombed, and more than half of the country’s Christian population has either fled or been killed. compound during the Sunday of June 9, injuring 15 people, including one pastor who had both his legs broken, another pastor who sustained serious injuries, and a 10-year-old child. Said another church leader, “The Christians living around the scene of the incident are still in shock and are wondering as to the mission behind the attack, while several pastors looked demoralized. But others said prayers will help them stand strong in sharing the Christian faith.” Islamic extremists from Somalia’s jihadi organization Al Shabaab are suspected of this and other attacks on Christians in the coastal areas of Kenya. has vowed to cleanse Somalia of all Christian presence, and its members have murdered dozens of Muslim converts to Christianity. and other Christian materials. Since then, the woman has been subjected to innumerable legal proceedings. Most recently, she was convicted of “Illegal production, storage, or import into Uzbekistan with a purpose to distribute or distribution of religious materials by physical persons.” The judge ordered that her Bible, 14 Christian books, six DVDs and a video be destroyed. She was told by court officials, “This is a Muslim country and all of your Christian books including the Bible are outlawed.” Because these proceedings have caused her extreme anxiety, after one hearing an ambulance was called for her. Christian symbols; sexual abuse of Christian women; forced conversions to Islam; apostasy and blasphemy laws that criminalize and punish with death those who “offend” Islam; theft and plunder in lieu of jizya (financial tribute expected from non-Muslims); overall expectations for Christians to behave like dhimmis, or second-class, “tolerated” citizens; and simple violence and murder. Sometimes it is a combination. 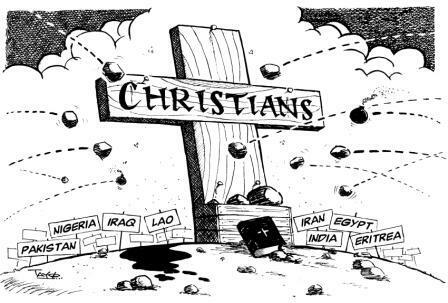 The persecution of Christians must be brought to light. Every time it is mentioned about America’s acceptance of Muslims, the first question should be–and how does that translate to the Muslim world’s treatment of Christians in their homelands? If it wasn’t for blogs such as this one, none of us would ever hear about the atrocities. The news media will never print anything about Islam in an unfavorable light. My guess is that the murder of Daniel Pearl caused journalists to adopt a perpetual “We’re wetting ourselves” editorial policy. Mustang, findalis at Monkey in the Middle posts this series. They are so important that I have put each of them under the tab under my banner. Daniel Pearl observation is a good one, but I think they just don’t want to let the public know that Christians and Jews are regularly persecuted by Muslims.